The on-going financial crisis results not from a cyclical or managerial failure, but from a structural one: more than 96 other major banking crises occurred over the past 20 years, and these crashes have happened under very different regulatory systems and at different stages of economic development. So far, conventional solutions are being applied—nationalization of the problem assets (as in the original Paulson bailout) or nationalization of the banks (as in Europe). These solutions only deal with the symptoms and not the systemic cause of today’s banking crisis. Similarly, the financial re-regulation that will be on everybody’s political agenda will, at best, reduce the frequency of such crises, but not avoid their re-occurrence. Better solutions are urgently needed because the last breakdown of this magnitude, the Great Depression of the 1930s, ended up in a wave of fascism and World War II. In this paper, we describe a recent conceptual breakthrough—based on the functioning of balanced ecosystems— that shows that all complex systems, including our monetary and financial ones, become structurally unstable whenever efficiency is overemphasized at the expense of diversity, interconnectivity and the crucial resilience they provide. The surprising insight from a systemic perspective is that sustainable vitality involves diversifying the types of currencies and institutions and introducing new ones that are designed specifically to increase the availability of money in its prime function as a medium of exchange, rather than for savings or speculation. Additionally, these currencies are expressly designed to link unused resources with unmet needs within a community, region or country. These currencies are know as complementary because they do not replace the conventional national money, but rather, operate in parallel with it. We propose that a systemic understanding and technical solution are now available that would ensure that such crashes become a phenomenon of the past. The most effective way for governments to support such a strategy of a more diverse and sustainable monetary ecology would be to accept a well-designed, robust complementary currency in partial payment of taxes during a period when banks are not in a position to fully finance the real economy. The choice of a complementary currency reflects both a technical issue (robustness and resilience against fraud) and a political one (what type of programs are desirable to support). A good candidate for consideration would be a professionally run business-to-business (B2B) complementary currency based on the model of the WIR system. This currency has been successfully operational for 75 years in Switzerland, involving a quarter of all the businesses in that country. Formal econometric analysis has proven that the WIR acts as a significant counter-cyclical stabilizing factor that explains the proverbial long-standing stability of the Swiss economy. 2. Why Save the Banks? “Money is like an iron ring we put through our nose. It is now leading us wherever it wants. 1A major global financial crisis is upon us. Indeed, the infamous “subprime crisis,” which first hit the American banking system in August 2007, has been spreading internationally. It reached a new level of global banking systemic contagion in the fall of 2008. The subprime issue turns out to be only the tip of the iceberg, however, as the same lax practices that were applied to mortgages were also prevailing for car loans or student loans, and credit card debt in the United States. The question that is being debated is the depth and extent of the crisis―whether it can become “as bad as the 1930s Depression”. For instance, Alan Greenspan, the former Chairman of the US Federal Reserve, has stated publicly: "Let's recognize that this is a once-in-a-half-century, probably once-in-a-century type of event. "1 Figure 1 is a graphic illustration of what he is referring to. The causes of this crisis will be debated for years to come. What nobody is arguing about is that the financial sector has chalked up losses on an unprecedented scale. 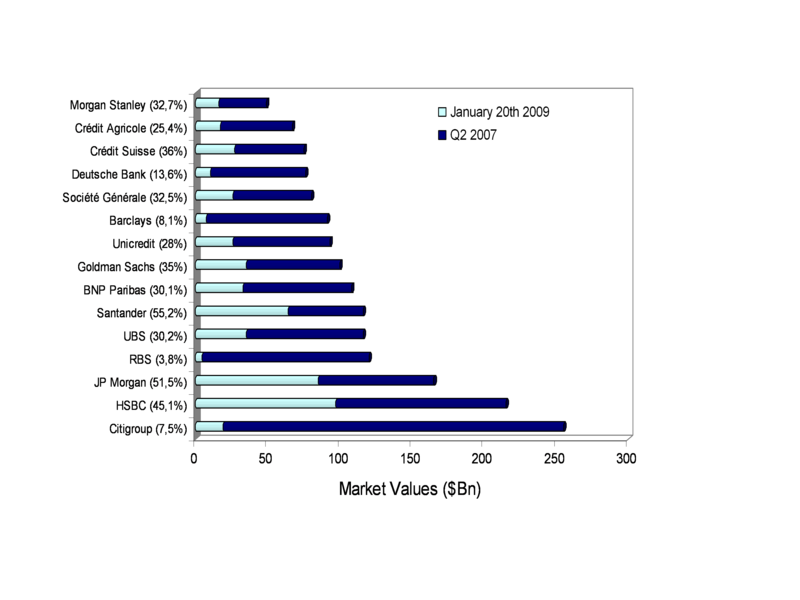 The horizontal bars represent the capitalization of some of the major banks in the world as of the 2d quarter of 2007; while the light blue segments represent what was left of it as of January 20, 2009. The percentage of what is left is given for each bank. What is unusual in this particular banking collapse, is its magnitude, and its simultaneity on a global level. 2We have now entered the period of unprecedented convergence of four planetary problems—climate change, financial instability, high unemployment and the financial consequences of an aging society—as described in an earlier book (Lietaer, 2001)It is most likely that the ensuing crisis will now play out in a classic pattern of two or three steps backwards for every step forward. Every small step forward (i.e. any temporary improvement) will predictably be hailed as the “end of the crisis.” It is quite understandable why governments, banks and regulators will make such statements simply because saying otherwise would only make the situation worse. 3The next logical phase in this systemic crisis is now unfolding on automatic pilot. Whatever governments do, the banks and other financial institutions will want to cut back drastically on their loans portfolios wherever possible, in order to rebuild their balance sheets after huge losses. This in turn will weaken the world economy to the point of a recession, which will spiral into a possible depression because of the lack of credit being made available to business. Thus, while cutting back on its loan portfolio is a logical reaction for each individual bank, when they all do simultaneously, it deepens the hole for the world economy and ultimately for the financial system itself. 2 The Economist October 11, 2008 pg 13. 4The Economist editorializes in a lead story: “Confidence is everything in finance...With a flawed diagnosis of the causes of the crisis, it is hardly surprising that many policymakers have failed to understand its progression.”2 This paper will show that this is indeed the case, although in a deeper way than The Economist itself seems to assume. How can we do better this time? What are the strategies that will avoid getting us caught into an economic tailspin? What are all the options available to deal with large scale systemic banking crises? 6The purpose of this paper is to answer these three questions. 3 Expression that was first coined by Schumpeter. 7Since governments’ initial response has been to bail out banks and other financial institutions, the first question must be: Why should governments and taxpayers get involved in saving banks in the first place? After all, when a private business fails, that is considered part of the “creative destructiveness”3 that characterizes the capitalist system. But when large banks fail, somehow that doesn’t seem to apply, as shown again in the present-day scenario. 8The short answer as to why banks are being saved is fear that the 1930 Depression nightmare would again become a reality. Since banks enjoy the monopoly of creating money through providing loans, bankrupt banks means reduced credit, which in turn results in a lack of money for the rest of the economy. Without access to capital, business and the means of production contract, which, in turn, causes mass unemployment and a host of collateral social problems. Thus, when banks are in trouble, they can trigger what is know as a Second Wave crisis, through a ferocious circle making a victim of the real economy: Bad banking balance sheets => credit restrictions => recession => worse bank balance sheets => further credit restrictions and so the spiral downward goes. 5 Front page headline in the Financial Times Tuesday, October 14, 2008 pg. 1. 10The next logical step is also formulaic. Whenever a bank that is too big to fail is in real trouble, the recipe has been the same since the 1930s: the taxpayers end up footing the bill to bail out the banks, so that they can start all over again. Of the 96 major banking crises around the world that the World Bank has counted over a recent 25 year period (Caprio & Klingebiel, 1996), taxpayer bailouts have been the answer in every instance. For example, the United States government that had funded Reconstruction Finance Corporation during 1932-53 period, repeated the exercise with the Resolution Trust Corporation for the Savings and Loan crisis in the 1989-95 period, and now again with the Troubled Assets Relief Program (TARP) of 2008. Other recent examples include the Swedish Bank Support Authority (1992-96) and the Japanese Resolution and Collection Corporation which started in 1996 and is still ongoing. In the current international crisis, among the first institutions that were saved in this way include Bear Stearns in the US, and the nationalization of Northern Rock in the UK. By mid-October 2008, European governments pledged an unprecedented 1.873 trillion Euros, combining credit guarantees and capital injections into banks, based on the strategy pioneered by the United Kingdom.5 These bailouts end up being expensive for the taxpayers and the economy at-large. One exception has been in Sweden, which ended up costing “only” 3.6% of the Swedish GNP because important parts of the portfolio could be unwound over time at better conditions than those when the assets we originally acquired. But such outcomes are rare. 11If we add in the Citibank bailout announced in November 2008 to all the previous packages already approved, the total pledges by the American taxpayer of the bailout exceeds now $4.616 trillion dollars! In February 2009, the US Treasury Secretary Timothy Geithner unveiled an additional bank bail-out plan worth at least another $1.5 trillion6 The Bloomberg estimate for the total is that the US taxpayer will be billed a total of 7.7 trillion7, which amounts to $ 24,000 for every man, woman and child in the country. The only event in American history that comes even close to the pledges made so far is the cost borne by the US for waging World War II: Original Cost: $288 billion, Inflation Adjusted Cost: $3.6 trillion. It is hard to believe, but true, that the US bailout could cost more than the inflation adjusted cost of the Louisiana Purchase, the New Deal and the Marshall Plan, the Korean and Vietnam War, the S&L debacle, NASA and the Race to the Moon combined!8. 13In short, governments, the world over, have just bled themselves dry to an unprecedented extent, to the point that the Financial Times even wonders whether the worldwide panic in October 2008 “is not about faith in the banks, but faith in the governments to save them.”10 This begs the question: What happens when the costs for rescuing the bank system become unbearable? Governments learned in the 1930s that they can’t afford to let the banking system go under, as this brings down the entire economic system. What some may learn in our times is that they can’t afford to save the banking system. 14The first strategy, re-regulating the financial sector, will predictably be on everybody’s political agenda, particularly for a new administration in the US. The debate about how and what to regulate will be intense. History shows, however, that we have engaged in the same cat and mouse game between regulators and banks for several centuries, since the beginning of handing the money issuance function to the private banking system. To be precise, while such re-regulation may avoid the repetition of the identical traps and abuses next time, over time new loopholes will be discovered or created, resulting in a new variation of the same banking crisis11 Some re-regulation is, at this point, politically unavoidable, and we concur with the general consensus that it is also necessary. It will be clearly shown below, however, why this solution will, at best, only reduce the frequency of such crashes, not avoid their repetition. Furthermore, stricter regulation may also lengthen the period necessary for banks to improve their balance sheets, which will simply deepen and prolong the “Second Wave” problem. 15There are two conventional ways for governments to prop up the banks balance sheets, both involving a form of nationalization. The first is nationalizing what Ben Bernanke called in his presentation to the US Congress the banking system’s “toxic assets”. The second is nationalizing the banks themselves. Let’s briefly explore the advantages and disadvantages of both. 16This solution is invariably preferred by the banks themselves. It consists of either the government (in the initial Paulson bailout plan, for example, it is the U.S. Treasury Department), the creation of a “bad bank”, or of another specially created institution funded by the government destined to buy assets from the banks that they now want to jettison. Of course, determining the price at which these assets are purchased is a very tricky issue, particularly when a liquid market for such assets has dried up completely, as is the case now. If the government buys the assets at too high a price, it will be seen as a straightforward subsidy for previous bad behavior, and accentuate the “moral hazard” problem (defined below), something that is politically unpalatable. On the other hand, if the government buys the assets at too low a price, it doesn’t really replenish the banks’ balance sheet. Buying the toxic assets clearly does not convince everybody as an appropriate remedy.12 It is also by far the most expensive solution, because it does not take advantage of the leveraging factor available in the banking system (as explained below). Consequently, the injection of money by the government as capital directly to the banks is a lot more effective financially. 17The second way to buttress the banks is by governments providing capital directly to banks themselves, either by buying stocks, or by acquiring a newly issued preferred stock. For example, this is what Warren Buffet did for Goldman Sachs in September 2008 in the US: He injected $ 5 billion in the form of preferred stock that would give him not only 7% of the capital, but also a guaranteed 10% dividend forever. In Europe, governments have typically taken the bank-nationalization road, although with less demanding terms than what Warren Buffet obtained. Nationalizing the banks was the option taken for instance in Sweden in 1992; and in 2008 first for Northern Rock in the UK, and then for a wide range of banks in all countries by Fall 2008. 18There are two advantages in this approach compared to the previous one of nationalizing the toxic assets. First, thanks to the fractional banking system by which all money is created, when banks make loans to customers, they can create new money at a multiplier of the amount of capital they actually have. Consequently, if a bank’s leveraging factor is 10, then injecting $1 billion in the bank’s capital makes it possible for it to create at least $10 billion in new money, or carry $10 billion in problem assets. In fact, the multiplier is typically much higher. For instance, Lehman’s and Goldman Sachs’ ratio of assets to capital were respectively 30 and 26. Some European banks had even a higher leverage: BNP Parisbas at 32; Dexia and Barclays’ leverage ratios are both estimated at about 40; UBS’ at 47; and Deutsche Bank’s a whopping 83.13 Therefore, very conservatively put, it is 10 times more financially effective for governments to bolster the balance sheets of the banks directly than to buy toxic assets. The second advantage to buying bank shares instead of toxic assets is that there is generally a market which indicates some relative value between different banks. In contrast, when the market for toxic assets has dried up, there is no such indication, and the decisions can be quite arbitrary. 19The banks themselves, of course, prefer to avoid the dilution of bank equity and control that this approach implies. Politically, nationalizing the banks also sounds like the “socialization” of the economy, since the former communist states all had nationalized their banks. This ideological taint may explain why this approach was not initially considered in Washington. Yet, some of the unmentioned additional risks of the crisis must not be underestimated The cost of bailing out the world’s financial system will unquestionably significantly increase governmental debt, which somehow will have to be financed from somewhere. For instance, today, the US’ biggest financiers―China, Russia and the Gulf states―are rivals to the US, not allies. At this point all are condemned to cooperate to some extent, in order to reduce the effects on their own economies, but such “forced” cooperation is a highly unstable one. The question is: What will happen to already shaky national currencies during such wrangling, including several developing countries’ and Eastern European ones, not to mention the dollar itself? 20The first objection to nationalizing banks or their toxic assets is the well known “moral hazard” problem. If banks know that they will be saved when in trouble, they may be tempted to take higher risks than otherwise would be prudent. When these risks pay off, the profits are held privately and translated into generous dividends for the banks’ shareholders and extraordinary bonuses to management. But when they fail, the losses end up being absorbed by the taxpayers. The current salvage programs confirm that this problem hasn’t gone away and is unavoidably further strengthened by new bailouts. Christine Lagarde, Minister of the Economy, Industry and Employment in the current Sarkozy government in France, stated “Moral hazard has to be dealt with later…Maintaining the functioning of our markets is the top priority”.14 This is exactly the argument that pops up at every systemic crisis. 21Secondly, even if both strategies –bailing out the banks and re-regulation of the financial sector—are implemented reasonably well, neither resolves the “Second Wave” problem: The banking system will get caught in a vicious circle of credit contraction that invariably accompanies the massive de-leveraging that will be needed. Depending on how the re-regulation is implemented, it may actually inhibit banks from providing the finances needed for a reasonably fast recovery of the real economy. In any case, given the size of the losses to be recovered, it will take many years, in the order of a decade, certainly more than enough time to bring the real economy into real trouble. 22In practice, this means for most people in the US, in Europe, and in most other parts of the world, in NYU Professor Nouriel Roubini’s words, “this recession will be long, ugly, painful and deep.” We are only at the beginning of a long, drawn-out economic unraveling. The social and political implications for such a scenario are hard to fathom. The last time we faced a problem of this size and scope was in the 1930’s, and we didn’t deal too well with the problem at that time. Still, there are important differences vis-à-vis the situation of the 1930s. So far, the situation is less extreme economically, in unemployment and business bankruptcies, than what happened in the early 1930s. On the other hand, governments are now a lot more indebted than was the case at the beginning of the Great Depression; and today’s crisis is a lot more far reaching globally15, and is spreading a lot faster, than was the case then. 23More important still, a financial/banking issue isn’t the only one we have to deal with. It happens to coincide with several major global challenges, by now generally accepted: climate change and mass species extinction, the increase of structural unemployment, and the financial consequences of unprecedented aging in our societies. In some respects, therefore, today’s crisis is less dramatic, and in others far more complex than what our previous generation had to face. 24Nationalizing the money creation process itself is an old proposal—if much less conventional approach—that reappears periodically in the monetary reform literature, particularly during periods of major banking crises. Until now, it has drawn surprisingly little attention in the financial media. 25For historical reasons, the right to create money was transferred to the banking system as a privilege, originally to finance wars during the 17th century. So, contrary to what some people seem to believe, our money is not created by the governments or the central banks, it is created as bank debt. When banks are private, as they are in most of the world, the creation of money is therefore a private business. If the banking system abuses this prerogative, this privilege could or should be withdrawn. The logic is not new: money is a public good, and the right of issuing legal tender belongs at least theoretically to governments. For instance, The US constitution specifies that the power of issuing money is an exclusive prerogative of Congress. There is a long list of famous quotes concerning this topic by various American presidents and founding fathers. (See Box 1 for some samples16). 26So, while bailing out the banking system through nationalizing banks or nationalizing the problem assets is the classical policy choice, it can also be expected that proposals for nationalizing the money creation process itself will reemerge, as they have in previous predicaments, including the 1930s. Under a government-run monetary system, the governments would simply spend money into existence without incurring interest at its creation; banks would become only brokers of money they have on deposit, not creators of money, as is the case now. 27There are pros and cons in this strategy. On the pro side, it would definitely make systemic banking crises a problem of the past. It would also make possible to re-launch the economy through a large-scale Keynesian stimulus at a much lower cost to the taxpayers, given that the money thus created wouldn’t require interest payments to be reimbursed in the future. 28One objection to a government managing the monetary system is that governments may abuse this power, issue more money than is appropriate, and thereby create inflation. That argument is valid. Given that the current method of creating money through bank-debt has made the 20th century one of the highest inflationary centuries on the historical record, however, inflation is obviously not a problem specific to the process of money issuance by governments. Furthermore, there is no reason that Milton Friedman’s proposal for the issuance of money by the central banks couldn’t be applied to governments as well: put in place a rule that obliges the issuing body to increase spending by no more than a fixed 2% per year, reflecting the improvements of productivity in the economy. 30Our own objection to this solution is that, even if governments were to issue the money, that might protect us from banking crises, but it would nevertheless not solve the core systemic problem of the instability of our money system. In short, it might protect us from banking crises, but not from monetary crises as will be explained next. 31The solution proposed below is new, and relates to the identification of the fundamental systemic cause for our monetary and financial instability. Understanding this solution, however, requires that we identify some evidence as to why a systemic problem is likely, that we develop a scientifically-sound understanding of its nature, and, finally, that effective ways to address the trouble are addressed. 32The good news now is that we know a lot more than in the 1930s; and that we have many more tools available than even a decade ago. Consequently, it is now possible to identify the deeper underlying systemic causes, as well as, a new way to deal with them. Furthermore, this new way is one that governments can afford, and that actually addresses a number of other social and economic issues that exist even when there is no financial crisis. 33At first sight, it may not be the bankers’ preferred solution, but it would actually stabilize their own portfolios while structurally stabilizing the economies of the world. It would also give them a whole new line of business, in activities that would be particularly attractive for local and regional banks. Introducing such a systemic solution is the only way to avoid periodically repeating the banking-crisis exercise, which all conventional approaches are condemned to do because they deal only with some of the symptoms, and not the cause. 34A lot of energy and ink will be spent trying to allocate the blame for this disaster. Greed in the financial sector, lack of oversight by regulators, policies that over-emphasize deregulation, and incompetence at various levels, will all become favorite targets. Our view is that any or all of these may indeed have played a role, but at the core we are dealing, as already stated, with a much deeper systemic issue. 35Indeed, while the current crisis may be the biggest one ever, it isn’t the first such crisis. The World Bank has identified no less than 96 banking crises and 176 monetary crises in the 25 years since President Nixon introduced the floating exchange regime in the early 1970s (Caprio & Klingebiel, 1996). Furthermore, even before this period, booms and bust cycles involving banking and monetary crises were, in Kindleberger’s words, a remarkably “hardy perennial” (Kindleberger, 1978: p 1). Kindleberger inventoried no less than 48 massive crashes ranging from the 1637 tulip mania in Holland to the 1929 crash on Wall Street. Such repeated financial breakdowns, in very different countries and times, under different regulatory environments, and in economies with very different degrees of development, should be seen as a first telltale symptom of some underlying systemic or structural problem. 36If such a deeper issue is involved, it would explain why each new set of regulations achieves, at best, a reduction in the frequency of banking and monetary crises, without getting rid of them or their horrific economic and socio-political costs. If such a deeper structural problem exists, it would also explain why even some of the brightest and best educated people on the planet have not been able to avoid major financial catastrophes, however diligently they do their work, whether on the regulatory or on the financial services side. Finally, if our money system is indeed a structural “accident waiting to happen”, then even if it were possible to perfectly control greed through innovative, tight, regulations, this will only defer when the next disaster will hit. 37There is now scientific evidence that a structural issue is indeed involved. The theoretical origin of this evidence may be surprising to the economic or financial community, although it would not be such a surprise for scientists familiar with natural ecosystems, thermodynamics, complexity or information theory. The science that explains this issue rests on a thermodynamic approach with deep historical roots in economics.18 In this view, complex systems, such as ecosystems, living organisms, and economies are all seen as matter-, energy-, and information-flow systems. For example, the famous food chain is actually a matter/energy flow-network built of complex relationships among organisms. Plants capture the sun’s energy with photosynthesis; animals eat the plants; species then eat each another in a chain to top predator, only to have all organisms die, decompose, and their energy/matter be recycled by bacteria. Similarly, economies are circulation networks consisting of millions of businesses and billions of customers exchanging different products and services, which when taken as a whole, are supposed to meet the needs of all participants. The details of this systemic problem are mathematically described elsewhere, and only a short, simplified summary will be provided here. For readers desiring full technical and mathematical proof of what will be claimed here, please see (Ulanowicz et al., 2009). 39Our new approach, as shown below, provides a concise and solid explanation of why a use a new set of tools is needed to understand the monetary and economic dynamics as they actually manifest in the real world. 20 (e.g. Cvitanovic, 1984; Eigen & Schuster, 1979; Estep 2003, 2006; Dressler 2007). 40A growing body of empirical and theoretical work, published under different academic banners such as Self-organization Theory Universality Theory or Non-linear Dynamics, shows that all flow systems follow certain universal principles and patterns20. Consequently, as Goerner says about universality: “all [flow] systems, no matter how complex, fall into one of a few classes. All members of a class share certain common patterns of behavior.”(Goerner, 1999: p153). Similarly, Cvitanovic explains: “The wonderful thing about this universality is that it does not matter much how close our equations are to the ones chosen by nature, as long as the model is in the same universality class…as the real system. This means that we can get the right physics out of very crude models.”(Cvitanovic, 1984: p11). The existence of parallel patterns and dynamics explains why similar energy-flow concepts and analysis methods apply to economic systems as well as natural ones. 2) Resilience: a networks reserve of flexible fall-back positions and diversity of actions that can be used to meet the exigencies of novel disturbances and the novelty needed for on-going development and evolution (Holling, 1973, 1996; Walker, et al., 2006). 43Two key structure-related variables—Diversity (the existence of different types of agents acting as “nodes” in the network) and Interconnectivity (number of pathways between agents)—play a central role in both efficiency and resilience, but in opposite directions. In general, a system’s resilience is enhanced by more diversity and more connections, because there are more channels to fall back on in times of trouble or change. Efficiency, on the other hand, increases through streamlining,which usually means reducing diversity and connectivity. 44The main point is that nature does not select for maximum efficiency, but for an optimal balance between the two opposing poles of efficiency and resilience. Because both are indispensable for long-term sustainability and health, the healthiest flow systems are those that maintain an optimal balance between these two opposing pulls. Conversely, an excess of either attribute leads to systemic instability. Too much efficiency leads to brittleness and too much resilience leads to stagnation; the former is caused by too little diversity and connectivity and the latter by too much diversity and connectivity. 45Sustainability of a complex flow system can therefore be defined as the optimal balance between efficiency and resilience of its network. With these distinctions we are able to define and precisely quantify a complex system’s sustainability in a single metric. Indeed, there is now a way of quantitatively measuring all the relevant components separately: total throughput, efficiency, and resilience. Furthermore, the underlying mathematics are well-behaved enough so that there exists only one single maximum for a given network system. The generic shape of the relationships between sustainability and its constituent elements is shown in Figure 2A. Observe that there is an asymmetry: optimality requires more resilience than efficiency. (The optimal point lies closer to resilience than efficiency on the horizontal axis). (A) Sustainability curve mapped between the two polarities of efficiency and resilience. Nature selects not for maximum of efficiency, but for an optimal balance between these two requirements. Notice that resilience is roughly two times more important than efficiency at the optimum. All natural eco-systems operate within a fairly narrow range on each side of the Optimum point called the “Window of Viability”. (B) The dynamics of an artificially enforced monoculture in a complex system where efficiency is the only criterion considered relevant. The only possible outcome is systemic collapse. (C): The Effect of Diverse Complementary Currencies. The operation of complementary currencies of diverse types enables the economy to flow back towards a higher sustainability (green arrow). While this process clearly reduces efficiency, it is the price to pay for increased resilience of the whole. Complementary currencies facilitate transactions that otherwise wouldn’t occur, linking otherwise unused resources to unmet needs, and encouraging diversity and interconnections that otherwise wouldn’t exist. 46Until recently, total throughput and efficiency have been the only means for us to identify the relative success of a system, whether in nature or in economics. For example, in ecosystems, as in economies, size is generally measured as the total volume of system throughput/activity. Gross Domestic Product (GDP) measures size this way in economies and Total System Throughput (TST) does so in ecosystems. Many economists urge endless growth in size (GDP) because they assume growth is a sufficient measure of health. GDP and TST, however, are poor measures of sustainable viability because theyignore network structure. They cannot, for example, distinguish between a resilient economy and a bubble that is doomed to burst; or between healthy development, as Herman Daly (1997) describes it, or explosive growth in monetary exchanges simply due to runaway speculation. 48The question will undoubtedly be raised whether what we learn from ecosystems still makes sense when applied to other systems, such as economic communities. It is critical to understand that the findings described so far arise from the very structure of a complex system, and therefore that they remain valid for any complex network with a similar structure, regardless of what is being processed in the system: It can be biomass in an ecosystem, information in a biological system, electrons in an electrical power network, or money in an economic system. This is precisely one of the strong points of using a web-like network approach instead of machine-like metaphor. 49For instance, Vaz and Colleagues (2003) have discussed the advantages of portraying the immune system as a network and in particular, how this concept can help the understanding of stable and previsible regularities, which cannot derive from random mechanisms. 50The fields of engineering, business and economics have all been focusing almost exclusively on efficiency, and therefore constitute a wide-open field to explore the validity of the proposed metrics to improve sustainability. For example, electrical power grids have been systematically optimized for decades towards ever greater technical and economic efficiency. It has come as a surprise to many engineers that, as they have approached higher efficiencies, suddenly large-scale blackouts have been breaking out with a vengeance “out of nowhere”. For instance, a few decades ago, several blackouts hit large areas of the United States. The data should be available to model these systems as networks because that is what they literally are. One can then quantify their efficiency and resilience, and their Window of Viability. The solution on how to rebalance such a system to make it less brittle, and to determine its optimal sustainability would be an obvious hard science test application of the metrics described here. 51The point being made here is truly profound and has wide-reaching implications for all complex systems, natural or human-made, including our worldwide financial and monetary system. Placing too much emphasis on efficiency tends to automatically increase size and consolidation at the expense of diversity, connectivity, and resilience until the entire system becomes unstable and collapses. In short, excessive focus on efficiency tends to create exactly the kind of bubble economy which we have been able to observe repeatedly in every boom and bust cycle in history, including the biggest bust of them all, the one that we are experiencing today. 52Viewing economies as flow systems emphasizes directly money’s primary function as medium of exchange. In this view, money is to the real economy like blood is to your body: it is an essential vehicle for catalyzing processes, allocating resources, and generally allowing the exchange system to work as a synergetic whole. Let us emphasize that the findings described below are relevant for any network of a similar structure, therefore the applicability to an economic network is not simply an analogy, but a direct application of the theoretical framework described above. The connection to structure is indeed immediately apparent. In economies, as in ecosystems and living organisms, the health of the whole depends heavily on the structure by which the catalyzing medium, in this case, money, circulates among businesses and individuals. Money must continue to circulate in sufficiency to all corners of the whole because poor circulation will strangle either the supply side or the demand side of the economy, or both. 53Our global monetary system is itself an obvious flow network structure, in which monopolistic national currencies flow within each country (or group of countries in the case of the Euro), and interconnect on a global level. The technical justification for enforcing a monopoly of national currencies within each country was to optimize the efficiency of price formation and exchanges in national markets. Tight regulations are in place in every country, to maintain these monopolies. In his seminal paper of 1953, Milton Friedman proposed that letting markets determine the value of each national currency would further improve the overall efficiency of the global monetary system. This idea was actually implemented by President Nixon in 1971, to avoid a run on the dollar at that time. 54Since then, an extraordinarily efficient and sophisticated global communications infrastructure has been built to link and trade these national currencies. The trading volume in the foreign exchange markets reached in 2007 an impressive $3.2 trillion per day, to which another daily $2.1 trillion of currency derivatives should be added. (Bank of International Settlements, 2008).Nobody questions the efficiency of these markets. 55The global network of our monopolistic national moneys has evolved into an overly efficient and dangerously brittle system. This system’s lack of resilience, however, shows up not in the technical field of the computer networks (which all have backups), but clearly in the financial realm. This fact has been spectacularly demonstrated by the large number of monetary and banking crashes over the past thirty years. Such crises, particularly a combined monetary and banking crash, are—other than war— the worse things that can happen to a country. 57Today’s global monetary ecosystem is significantly overshooting the optimal balance or the Window of Viability, because of its exclusive emphasis on efficiency. It is careening toward brittleness and collapse because a general belief prevails that all improvements need to go further in the same exclusive direction (red arrow) of increasing growth and efficiency. For instance, the global monoculture of bank-debt money as legal tender is technically justified on the basis of efficiency of price formation and exchanges within each country. Internationally, floating exchanges were also justified because they are “more efficient”. 58Similarly, the substance that circulates in our global economic network—i.e. money—is also maintained as a monopoly of a single type of currency (bank-debt money, created with interest). Imagine a planetary ecosystem where only one single type of plant or animal is tolerated and artificially maintained, and where any manifestation of diversity is eradicated as an inappropriate ‘competitor’ because it is believed it would reduce the efficiency of the whole. An overly efficient system as the one described in Figure 2B is “an accident waiting to happen”, condemned to collapse, however diligently a lot of competent people try to manage it. 59Similarly the issue of diversity matters obviously not only in types of money, but also in economic agents. For example, a town that has but one very large employer will find it harder to adapt if that company goes under, than a town with several medium size employers and many more small ones. At the other extreme, lack of economic efficiency, for instance through insufficient investments in infrastructure, leads to an inability to handle the activities needed to maintain flow across complex economies. 60As stated earlier, nature has over billions of years selected the conditions under which complex ecosystems are sustainable, otherwise they wouldn’t exist today. In contrast, humanity still struggles with the issue of how to create sustainable economies. We know that the theoretical framework applies to both natural and man-made complex systems. Has the time not come to learn in this domain from nature? 61The systemic solution to our monetary crisis, therefore, is to increase the resilience of the monetary system, even if at first sight that may be less efficient. Conventional economic thinking assumes the de-facto monopolies of national moneys as an unquestionable given. The logical lesson from nature is that systemic monetary sustainability requires a diversity of currency systems, so that multiple and more diverse agents and channels of monetary links and exchanges can emerge, as seen in Figure 2C. 62This is the practical lesson from nature: allow several types of currencies to circulate among people and businesses to facilitate their exchanges, through the implementation of complementary currencies. These different types of currencies are called complementary because they designed to operate in parallel with, as complements to, conventional national moneys. The structural problem is the monopoly of one type of currency, and replacing one monopoly with another isn’t the solution. As Edgar Cahn’s work with Time Dollars demonstrates (Cahn, 2004), complementary currencies encourage a much higher increase the degree of diversity and interconnectivity in the system, due to their ability to catalyze business processes and individual efforts that are too small or inefficient to compete for national currencies in a global market place. Several doctoral theses point to the same conclusion (Kelver, 2001; Wheatley, 2006; Schussman, 2007). This approach will certainly appear unorthodox to conventional thinking, but conventional thinking is precisely what got us into this trouble to begin with. This insight can also resolve the dilemma of what to do now about today’s systemic banking crisis. 63Our proposal focuses here on what can and should be done most urgently to reduce the impact of the financial crisis on the “real” economy, the one where businesses produce and sell non-financial goods and services. It involves three components: a) actions by the private business sector, b) decisions by national governments, and c) decisions by city and local governments. 64The “real” economy has already started to become the next victim of the financial crisis. Whatever governments do for the banks, credit will be a lot harder for companies to obtain from banks for years to come. Once a domino effect plays out in the real economy, when a chain of bankruptcies is started with all its effects on unemployment and other social problems, it will turn out even harder to stop than the dominos in the banking system. It is futile to hope that governments will be in a position to save even important businesses after having born the cost of bailing out the banks. However, there is something that companies can do themselves to avoid the worst aspects of this problem. It is possible for companies to lead themselves out of this crisis. 65Imagine that during a crisis similar to the one we are now mired, sixteen businessmen got together to decide what they could do among themselves. They or their clients had each received a notice from their respective banks that their credit line was going to be reduced or eliminated; hence bankruptcy was only a question of time. They realized that business A had needed the bank loan to buy goods from business B, which in turn needed money to buy stuff from its own suppliers. So they decided to create a mutual credit system among themselves, inviting their clients and suppliers to join. When business A buys something from B, A gets a debit and B the corresponding credit. They created their own currency, whose value was identical to the national money, but with the interesting feature that it didn’t bear interest. 66The country’s banks mounted a massive press campaign to try to squelch this revolutionary idea. Miraculously, that campaign failed, and this little system saved the businesses involved at the time. A cooperative was set up among the users to keep the accounts dealing with that currency. Soon participants could also borrow from that cooperative in that currency at the remarkably low interest rate of 1% to 1.5%. All such loans need to be backed by inventory or other collateral. Over time, the system grew to include up to one quarter of all the businesses of the entire country. 67Sixty-five years later, an American professor performed an econometric study proving that the secret for the country’s legendary economic stability was that strange little unofficial currency, circulating among businesses in parallel with the national money. That country’s well-known economic resilience was usually credited to some mysterious and unknown national characteristic. Whenever there was a recession, the volume of activity in this unofficial currency would expand significantly, thereby reducing the recession’s impact on sales and unemployment. Whenever there was a boom, business in national currency expanded, while activity in the unofficial currency proportionally dropped back again. The surprising implication of this study is that the spontaneous counter-cyclical behavior of this little “unorthodox” system actually helped the central bank of the country in its efforts to stabilize the economy. 68This story is not an urban legend, but the true story of the WIR system. The country is Switzerland and the sixteen founders met in Zurich in the year 1934 and the system is still operating today. The annual volume of business in the WIR currency is now about $2 billion per year. The American professor is James Stodder from Rensselaer University. His remarkable quantitative study uses more than 60 years of high quality data to prove the points made in this story (Stodder, 1998; 2000). The WIR system is also now accepting deposits and making loans in Swiss Francs, as well as in WIR (Studer, 1998). Interestingly, a proposal has recently been made in the Swiss Parliament to have the government accept payment of taxes in the WIR currency, as a way to dampen the effects of the banking crisis on the overall economy. Such a measure would indeed be the most powerful way for the Swiss government to support a more widespread acceptance of the WIR in all segments of society. 69It is proposed here that businesses take the initiative of creating such Business-to-Business (B2B) systems at whatever scale makes most sense to them. The big advantage, compared to what happened in Switzerland, is that with what is available with today’s information technology tools, setting up such a system can be achieved in a fraction of the time and costs of what it took in the 1930s. And, timeliness is going to be critical if one wants to avoid the social and economic ravages that will be unleashed by the unraveling of complex business supply chains. In the U.S., a nation-wide system would be justified. In Europe, ideally, such a system should be designed to be able to operate at the Euro zone level. Otherwise, we are going to see a lot of the economic gains achieved by European integration go to naught over the next decade. 70Additionally, businesses should consider lobbying their respective governments to have them accept their B2B currency in partial payment of business taxes. This could apply only temporarily, i.e. for the period during which the banking system will not be in a position to fulfill its traditional role of financing the real economy to the extent that is necessary. Partial payment of taxes—it could be as little as 10% or 20%—would be the most effective incentive that governments could provide to accelerate the widespread acceptance of this currency. The lobbyists have a simple but powerful argument: governments have just spent trillions of taxpayers money to save the banking system, in the hope that this would avoid spreading the contagion to other businesses. The strategy proposed here doesn’t cost the government any money, will actually increase tax revenue, and is the best systemic way to avoid spreading the rot anyway, regardless of governments’ efforts to help the banks. 71In the end, governments will not be willing or able to force banks to lend out to the real economy, anymore than you can push on a string. Therefore, in addition and parallel to accepting the usual bank-debt conventional money, during the transition period ― until the banking system has recovered fully enough to play its traditional role ― accepting some complementary currency for payment of taxes makes a lot of sense. Which currencies should be acceptable for payment of what types of taxes is a political question that remains open for each government to decide. 72As stated above, by accepting this currency in partial payment of taxes, the government provides a powerful incentive for businesses and people to accept it. Governments should probably not get involved in creating or managing payment systems. Their role should be to assess and determine the criteria of quality and reliability that makes the currency qualify for acceptance by the government. They indeed have a built-in interest in receiving payments in a robust currency. It is obvious that the existence of such a currency facilitates exchanges that otherwise wouldn’t happen, while conventional money or credit are difficult to obtain. These additional exchanges, in turn, increase the taxable income of the businesses involved, thereby starting a virtuous loop that counteracts the credit reductions by the banking system. 73There are two ways for a governmental entity to decide what percentage of taxes could be payable in complementary currency. The first one is to determine how much that entity purchases from the business sector. For instance, if 20% of the budget is for purchases from the corporate world, it could make sense to accept up to 20% of payment in the B2B complementary currency. Another approach is to levy taxes on a company in proportion to the volume of business that it realizes in that currency. In other words, all dollar sales are taxable in dollars, and all sales in complementary currency are payable in the corresponding complementary currency. For example, if a company does 10% of its business in complementary currency, 10% of its taxes would be payable in that currency. 74This strategy will increase taxable income to governments at different levels, particularly during a recession when taxable income dwindles. When people and businesses are strangled by lack of money, taxable income is automatically squeezed as well. By accepting some payments in currencies other than bank debt money, by definition more governmental income is possible. This isn’t theory. For instance, during the crisis of the ruble of the late 1990s, the Russian government accepted corporate taxes paid in copper. What we propose is a lot less extreme: complementary currencies are a standardized medium of exchange, which governments can spend to buy goods or provide services in the locations and communities that accept the complementary currency. 75One important decision for national governments will be to allow cities and local governments to choose for themselves the complementary currency that they are interested in encouraging by accepting it in payment of the city or state taxes. Why this is important is explained next. 76There are two reasons why it is recommended to allow cities and local governments to choose their own complementary currencies to implement this strategy. First, cities and local governments will be the first governmental entities to get into still deeper trouble than they are today; and second, they represent diversity and resilience at work. Given that this approach is radically new, it is simply safer to test out a new system as a pilot at a city or local level, rather than directly on a larger scale at the national level. 77Furthermore, cities and other local government entities will find themselves in the first line to bear the brunt of the social effects of the looming recession, while at the same time they will see their tax revenue shrink, and conventional financing through debt become much harder to obtain. This kind of problem is not going to be limited only to the US. 79The second argument for local currencies is that we have seen that diversity is a necessary condition to improve overall resilience of a complex network system. 80Finally, if specific issues are considered a political priority, other types of complementary currencies than the B2B one we described above could be considered. For instance, if carbon reduction is considered an important priority, a carbon reduction currency program could be launched and accepted in partial payment in taxes.25 Similarly, local or regional taxes could be paid partially in conventional money, and partially in regional currencies (Lietaer, 2008). Or international businesses could pay some of their taxes in Terras, a proposed global commercial currency, which is fully backed by a basket of commodities.26 In short, a whole new set of tools to create incentives for specific behavior patterns, either corporate or individual, is now available, tools that in most cases have already been successfully tested somewhere in the world. 81The speed at which the pragmatic application of this strategy can move is greatly facilitated in our times, thanks to the availability of softwares specifically designed to manage complementary currencies, and the Internet as a communication tool. For instance, the WIR cooperative, which we talked about above, has a large scale system operational in Switzerland in four languages that deals simultaneously with national money and WIR. There are also several other fully operational software packages available for specific complementary currency applications. 82It would be a good idea to consider particularly open source software for use in this case, as this would provide the flexibility to add new functions, or new currencies on the same smart card, without having to wait for the propriety software developers to catch up with their backlog. For instance, the Strohalm Foundation in the Netherlands has an open source software for mutual credit systems used for social purpose applications, which is already in operation in various countries. Similarly, the European Union has funded in cooperation with French regional governments the development of the SOL system 27 using three different types of complementary currencies on the same smart card, and this system is now also becoming available in open source. This application is currently in pilot phase in five different regions in France, and could easily be expanded for additional languages, including a fourth currency application for the B2B currency that is described above. Ultimately, an integrated complementary currency payment system using mobile phones will emerge, as these devices reduce the need for card readers to make transactions. 83The first objection will obviously arise from the banking system, which would prefer to keep the status quo of the monopoly they currently enjoy. One argument will be that they will see the proposed B2B currency as excluding the banking system from their usual function; in short technical terms it “disintermediates” the banks. However, this objection is valid if and only if the banks themselves choose not to get involved in providing accounts and transactions in the B2B currencies. It is interesting to note that some banks—local and regional banks particularly—have already gotten involved in providing account and payment services for several complementary currency projects. 84This is the case, for instance, of the Bank of Ithaca, who deals with Ithaca HOUR accounts in the city of Ithaca, New York; the GLS Bank in Germany with the Chiemgauer in Bavaria; or of the Raiffeissenbank in Vorarlberg, Austria. The logic is that local or regional banks can compete with the giant banks only by providing services that the big ones don’t bother to provide, and of course a client with an Ithaca Hour account with the Ithaca Bank will also tend to open a dollar account as well. So banks are going to be disintermediated by a broader use of complementary currencies if and only if they themselves choose to remain aloof of such developments. Even if they don’t get involved, however, banks would still benefit from the introduction of B2B currencies. The reason is that the counter-cyclical stability, as proven by the WIR precedent, is also helpful to the banking system’s portfolios. Finally, our proposal provides banks with a much less drastic compromise than, for instance, nationalization or losing the right to issue legal tender altogether. 85The second objection that is quite predictable will come from traditional economic thinking: using multiple currencies within a national economy reduces the efficiency of the price formation process and of the exchanges among economic agents. While this argument is valid, we know now that this overarching emphasis on efficiency is precisely what has reduced the resilience of the system, and made it so brittle. 86Notice that our approach builds on Hayek’s proposal to denationalize money (Hayek, 1976). Hayek envisaged to have each bank issuing its own currency, which would encourage competition among them to supply a “better” currency (in Hayek’s view meaning a less inflationary currency), than the monopoly of centralized money has proven able to provide. From our perspective, this still provides the users only with a choice among currencies of one single type: bank-debt money issued with interest. Furthermore, Hayek’s approach doesn’t address the lack of institutional diversity, the consequences of which have been spectacularly demonstrated by the current banking crisis when all major banks get simultaneously in trouble. 87This proposal goes beyond Hayek by providing a monetary ecology with a wider range of choices for people and corporations as medium of exchange. As long as there is transparency about the nature and the issuance process of the complementary currencies, such a wider choice would empower the users to choose different types of currencies for different types of transactions. For instance, for long-term financial contracts an inflation-resistant currency might indeed be the dominant criterion; but for neighborhood exchanges, other values embedded in the currency may become a more relevant choice. 88Our proposal, therefore, provides a structural solution to the instability of the monetary system, something which the current approaches are not even trying to achieve. Systemic solutions are the only ones that will avoid repeatedly having to go through the same type of problem in the future. For example, as the WIR example demonstrates, complementary currency systems have proven to be a key factor in fostering counter-cyclical stability. It has achieved this not only during the Great Depression of the 1930s, but also during every subsequent business cycle of the Swiss economy. 89A multi-scale multi-stakeholder strategy has a number of advantages for the different parties involved, particularly during the transition period that we now have entered. Leadership will be required at all levels—public and private, local and national—to lead ourselves out of this crisis. This table summarizes the implication of each of the five approaches to any large scale systemic banking crisis, as described here. Those implications are different for different actors. The following impacts are considered: the impact on bankers; on taxpayers and central governments; on local governments; on the 2d wave effects, and on the systemic cause. The + and - icons represent the degree of solution or preference or the degree of problem or dislike respectively. 90This approach will avoid or reduce the strangulation of the real economy by the banking credit contraction that unquestionably is going to occur. It would theoretically make sense from a systemic point of view to implement it at any time, but history teaches us that monetary changes invariably take place only after major crises or wars. The current crisis is clearly a major one. We will be forced to make some significant changes, so why not move in a direction that structurally prevents that the same crisis will take place again in the future? 91The decision that governments should reach—accepting partial payment of taxes in money other than exclusively bank debt money—rests completely within their own political decision power. This strategy is also very flexible: a government can decide to accept payment of certain taxes only, only for a given percentage, for specific types of complementary currencies chosen for their robustness and have other positive effects, and/or only for specific fiscal years. 92Until now, taxes have been payable only in “legal tender,” which means conventional bank-debt money. Any currency is an incentive scheme, and our current way of dealing with taxes and subsidies is limited to one single instrument. Bank-debt money needs to be scarcer than its usefulness to keep its value. With complementary currencies, a whole additional array of options become available, which can focus on—and fine tune precisely—the objectives that one wants to reach. We can, therefore, tailor the complementary currencies accepted for payments of taxes to the massive challenges currently faced around the world. 93Complementary currencies have proven a useful tool for enabling the design of incentive schemes in a wide variety of domains, regardless of whether or not a crisis is at hand. The evidence for this can be found in a number of publications (see Lietaer 2001; Greco, 2003; Cahn, 2004; Kent, 2005; Brown, 2007; Lietaer et al., 2009). Bank of International Settlements (2008) Triennial Central Bank Survey of Foreign Exchange and Derivatives Market Activity 2007- Final Results. Washington, DC. Beinhocker E. (2006). The Origin of Wealth: Evolution, Complexity, and the Radical Remaking of Economics. Cambridge, Mass: Harvard Business School Press. Boulding K. E. (1981). Evolutionary Economics. Beverly Hills, CA: Sage Publications. Brown E.H. (2007). The Web of Debt (Baton Rouge, Louisiana). Cahn E. (2004). No More Throw Away People. Washington, DC: Essential Books. Caprio G. & D. Klingelbiel (1996). “Bank Insolvencies: Cross Country Experience,” Policy Research Working Papers no.1620. Washington, DC: World Bank, Policy and Research Department. Costanza R. (1980). Embodied energy and economic valuation. Science 210:1219-1224. Cvitanovic P.(1984). Introduction to Universality in Chaos. Bristol, UK: Adam Hilger. Daly H. E. (1997). Beyond Growth: The Economics of Sustainable Development. Beacon Press, Boston. Dressler F. (2007) Self-Organization in Sensor and Actor Networks. Wiley & Sons. Eigen M. & P. Schuster (1979). The Hypercycle: A principle of natural self-organization (Springer Verlag). Estep M. (2003). A Theory of Immediate Awareness: Self-Organization and Adaptation in Natural Intelligence. Kluwer Academic Publishers. Estep M. (2006). Self-Organizing Natural Intelligence: Issues of Knowing, Meaning, and Complexity. Springer-Verlag. Friedman M. (1953). "The Case for Flexible Exchange Rates," in Essays in Positive Economics, Chicago: University of Chicago Press, pp. 157-203. Georgescu-Roegen N. (1971). The Entropy Law and the Economic Process. Cambridge, MA: Harvard University Press. Goerner S. (1999). After the Clockwork Universe: the Emerging Science and Culture of Integral Society. Floris Books, Edinburgh, UK. Greco T. (2003). Money: Understanding & Creating Alternatives to Legal Tender Chelsey Green Publishing. Hannon B. (1973). The structure of ecosystems. Journal of Theoretical Biology 41: 535-546. Hayek F. (1976). The Denationalization of Money: An Analysis of the Theory and Practice of Concurrent Currencies. Coronet Books; 3rd edition,1990. Holling C.S. (1973). Resilience and the stability of ecological systems. Annual Review of Ecology and Systematics, 4: 1-23. Holling C. S. (1996). Engineering resilience versus ecological resilience. Pages 31-44 in P. Schulze, editor. Engineering within ecological constraints. National Academy Press, Washington, D.C., USA. Huber J. & J. Robertson (2000). Creating New Money: A Monetary Reform for the Information Age. London: New Economic Foundation. Jantsch E. (1980). The Self-Organizing Universe. Pergamon, Oxford. Kelver B. (2001). The re-birth of local currencies: some key factors in making ‘funny money’ work. Doctoral dissertation, University of Oregon. Dissertation Abstracts International 40/01, 150. Kimball R. (1997). Forged in War: Churchill, Roosevelt and the Second World War, Harper Collins. Kindleberger C. (1978). Manias, Panics and Crashes, New York: Wiley & Sons, 3rd ed, 1996. Lietaer B. (2001). The Future of Money. Century, London. Lietaer B. (2008). Pour une Europe des Régions: les Regios, compléments nécessaires a l’Euro, Paris: Fondation Mayer. Lietaer B., S. Belgin & J. Dunne (2009). Of Human Wealth: New Currencies for a New World, Citerra Press. Boulder, CO. (in press). Leontief W. (1951). The Structure of the American Economy, 1919-1939. New York: Oxford University Press. May R.M. (1972). Will a large complex system be stable? Nature 238:413-414. Odum H. (1971). Environment, Power and Society. Wiley, London. Odum H. (1984). Embodied energy, foreign trade, and the welfare of nations. In: A. M. Jannsson (ed. ), Integration of Economy and Ecology, University of Stockholm Press, Stockholm. Prigogine I. (1967). From Being to Becoming. San Francisco: Freeman. Schussman A.T. (2007). Making Real Money: Local currency and social economies in the United States. Doctoral dissertation, University of Arizona. Dissertation Abstracts International 68/02, 196. Soros G. (1988).The Alchemy of Finance. London: Weidenfeld and Nicolson. Stodder J. (1998). “Corporate Barter and Economic Stabilization”.International Journal of Community Currency Research.Vol.2. Stodder J. (2000) “Reciprocal Exchange Networks: Implications for Macroeconomic Stability”. Albuquerque, New Mexico: Conference Proceedings, International Electronic and Electrical Engineering (IEEE), Engineering Management Society (EMS). Ulanowicz R.E. (2008). A Third Window: Natural Foundations for Life. New York: Oxford University Press. Ulanowicz R.E. et al. (2009). Quantifying sustainability: Resilience, efficiency and the return of information theory. Ecological Complexity 6(1): 27-36. Walker B.H. et al. (2006). Exploring Resilience in Social-Ecological Systems Through Comparative Studies and Theory Development:Introduction to the Special Issue.Ecology and Society. 11(1): 12. Weathley G. (2006). Complementary Currency and the Quality of Life: Social and Economic Capital Effects on Subjective Well-being Doctoral dissertation, University of Calgary. Dissertation Abstracts International 44/05, 176. Zorach A.C. and R.E. Ulanowicz. (2003). Quantifying the complexity of flow networks: How many roles are there? Complexity 8(3):68-76. 4 Central banks will encourage low short-term interest rates and higher longer-term ones, which makes it possible for banks to borrow at low cost from customers and the markets, and invest in long-term government bonds. This was done for instance in the US during the late 1980s, and it worked as planned. It enabled the banks to rebuild their balance sheets. However, even this relatively “mild” crisis (representing a bailout of 3.7% of GNP) took more than six years to be absorbed. 10 Gillian Tett “Leaders at wits’ end as markets thrown one tantrum after another” Financial Times October 11/12, 2008. pg 1. 11 See the classics in this domain, such as Charles Kindleberger Manias, Panics and Crashes: A History of Financial Crises. 12 See, for instance, James K. Galbraith “A Bailout we don’t need” Washington Post Thursday, September 25, 2008; Page A19 and Ken Silverstein “Six questions for James Galbraith on the Financial Crisis and the Bailout” Harper’s Magazine November 2008. 13 The leverage ratio is total assets/capital, which is the inverse of capital/assets ratio. The estimates for the capital to asset ratios are respectively 2.4% for Barclays, 2.1% for UBS and 1.2% for Deutsche Bank according to the Economist September 27, 2008 pg 84. See also “Briefing” in Trends-Tendances October 2, 2008, pg 17. 14 Michael Macenzie and John Authers, “The week that panic stalked the markets,” Financial Times October 11/12, 2008, pg. 2. 15 For instance, one could have lived comfortably through the 1930s in Latin America, North Africa and substantial parts of Asia. For more information on proposals to re-nationalize money creation, see (Huber & Robertson, 2000). 17 The current modus operandi provides a hidden permanent subsidy to the banking system through seignoriage. Huber and Robertson estimated this yearly subsidy to the banking system at 49 billion Pounds for the UK; $114 billion per year for the US; 160 billion Euros for the Euro zone; and 17.4 Trillion Yen for Japan. These benefits would accrue to the governments in the case of nationalization of the money creation process (For further details, see Huber & Robertson, 2000: pp 79-84). 18 Modern energy concepts and flow analyses were actually formally applied to economics as early as 1951, by Nobel laureate Wassili Leontief with his input-output analyses, modeling the flow of goods and value in economic systems (Leontief, 1951). Ecologists then applied these same flow concepts and analyses to ecosystems, only to have economists later reapply these enhanced energy understandings to economics. Odum (1971, 1984), Hannon (1973), and Costanza (1980), for example, have all used thermodynamics and flow-network analysis as the basis for understanding the activities in both economic and ecosystem networks; and Georgescu-Roegen (1971) developed an entire thermodynamic foundation for economics. 19 The misclassification of economics as a system in equilibrium is skillfully explained in Beinhocker, 2006;chaps 2 and 3. George Soros has explained the internal dynamics of why financial markets are not moving towards equilibrium (Soros, 1988). 21 The concept of resilience in ecological systems was introduced by Holling (1973) to describe models of change in the structure and function of ecological systems. Ecological Resilience is defined as a measure of how far the system could be perturbed without shifting to a different regime. Since then, the notion of resilience has grown in importance as a concept for understanding, managing, and governing complex linked systems of people and nature. Some ecologists consider resilience to be a measure of how fast a system returns to an equilibrium state after a disturbance. This definition is known as engineering resilience (Holling, 1996). (see Walker et al. 2006 and references therein). 22 In the original literature this window is called a “window of vitality” given that natural ecosystems support complex life forms only within this range. (See Zorach & Ulanowicz, 2003; Ulanowicz, 2008). 23 We have yet to formally quantify the window of viability of the global monetary system, although such an exercise is achievable if the data about global flows by currency and institution are available. However, seen as an ecosystem, we are clearly dealing with a monoculture of bank-debt money worldwide. A monoculture is by definition lacking the diversity of any natural ecosystem, and pushes us away from the resilience pole. The institutional pressure on efficiency further pushes in the same direction. 24 James Doran, “America’s Latest Export: Empty Municipal Coffers,” The Observer, Oct. 12, 2008, pg. 8. 25 An Interreg proposal has been submitted in the European Union to have half a dozen different European cities implement carbon reducing currencies. Dublin, Bristol, Brussels, Amsterdam, and Bremen are among the cities that have formally accepted to participate in this project. 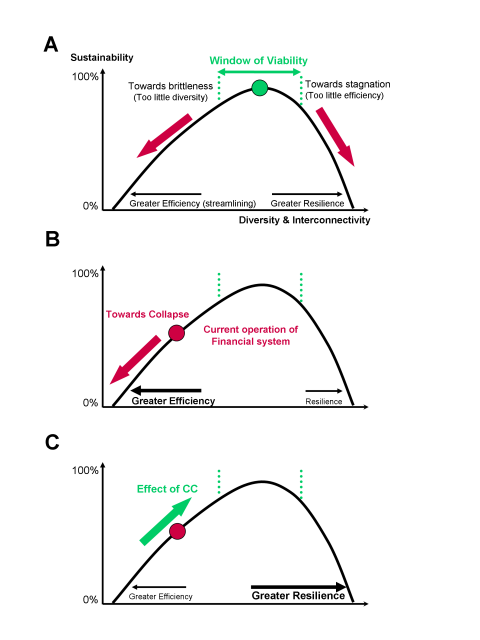 (A) Sustainability curve mapped between the two polarities of efficiency and resilience. Nature selects not for maximum of efficiency, but for an optimal balance between these two requirements. Notice that resilience is roughly two times more important than efficiency at the optimum. All natural eco-systems operate within a fairly narrow range on each side of the Optimum point called the “Window of Viability”. (B) The dynamics of an artificially enforced monoculture in a complex system where efficiency is the only criterion considered relevant. The only possible outcome is systemic collapse. (C): The Effect of Diverse Complementary Currencies. The operation of complementary currencies of diverse types enables the economy to flow back towards a higher sustainability (green arrow). While this process clearly reduces efficiency, it is the price to pay for increased resilience of the whole. Complementary currencies facilitate transactions that otherwise wouldn’t occur, linking otherwise unused resources to unmet needs, and encouraging diversity and interconnections that otherwise wouldn’t exist.